This offering is for my Red Stocking Hanging needle punch. 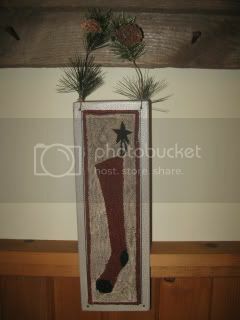 Its a skinny stocking punched on weavers cloth in cranberry dmc floss with a cream background that matches nicely with the crackled paint of the tin hanger. 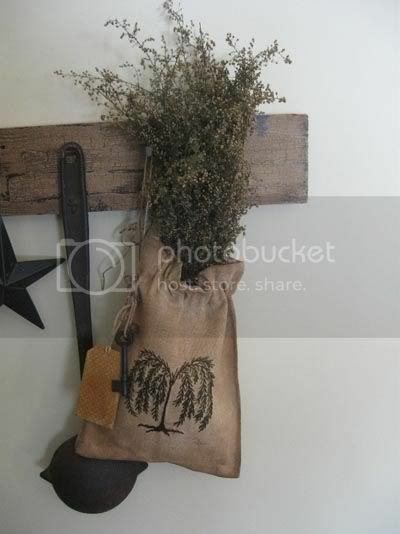 I attached a wire evergreen and pinecone branch for hanging off a peg nail, hook or knob. A simple Christmas goodie for your Holiday fun! Designed by me, will come signed, dated and copyright 2009. 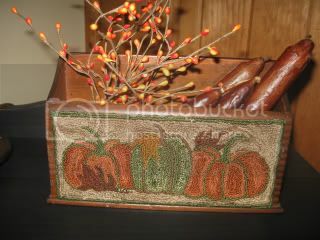 Measurements are 16"long including hanger and 4"wide. 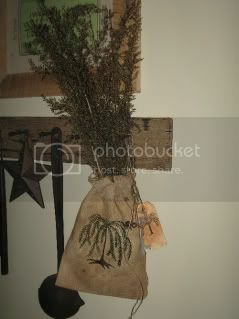 This little ditty bag is full of some Christmas treats -Fresh Sweet Annie, Evergreen branches and some berry sprigs. 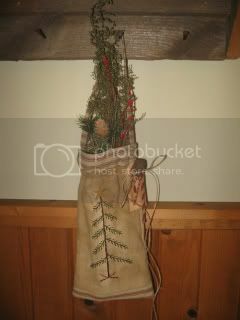 I stitched up a simple Christmas tree on coffee dyed flour cloth, sewed some red and cream ticking along the bottom and top, ran a twine drawstring through and attached a candy cane hang tag, a small chenelle candy cane and 2 rusty bells. A matching ticking strap was stitched on for the hanger. 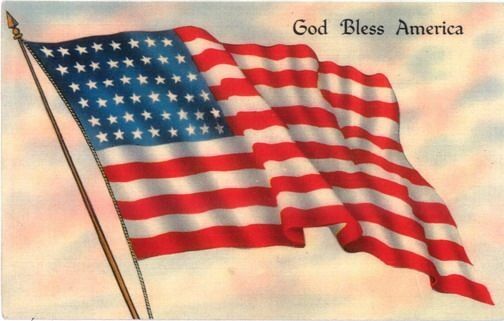 A nice size for hanging up somewhere in your home for the Holidays. 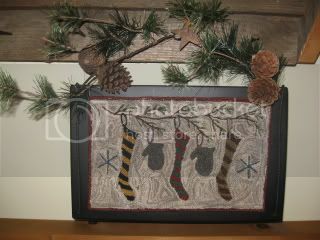 Measurements are 18" long including the hanger and 6" wide. 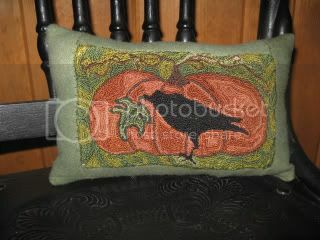 I bet a lot of you thought I gave up stitching! 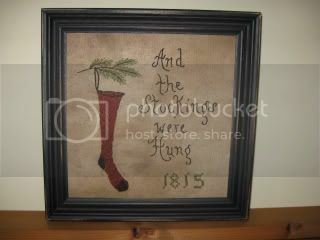 Well here is a Christmas stitchery I made up, "And the Stockings were Hung". 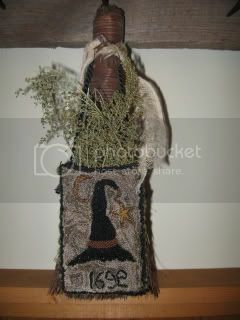 I stitched this stocking piece on coffee dyed osnaburg. 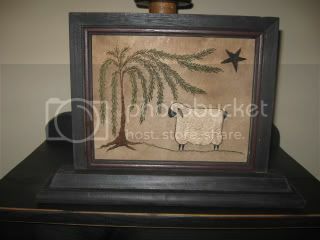 I used a square black distressed frame that measures 9 1/2" x 9 1/2", there is glass and a sawtooth hanger. 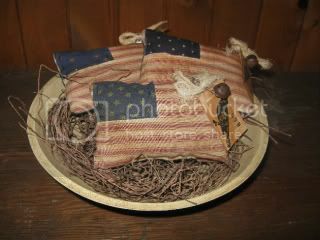 This piece will come signed, dated and copyright 2009. 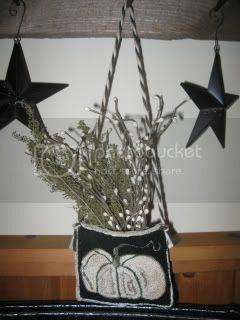 A cute addition for your Christmas decorating! Hard to believe that Christmas is right around the corner! 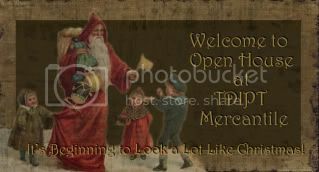 The artists of the To Dwell in Primitive Thymes will be having their annual "Christmas Open House" beginning November 1st with more updates on the 15th. 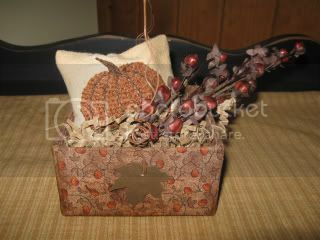 Please be sure to stop on over to our blog and website next week for some delightful Holiday creations, Prizes and Fun! Mark your calendar! 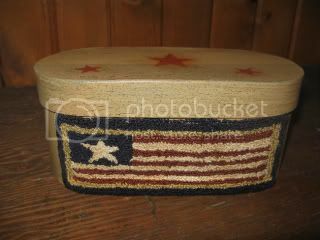 For the month of May the TDIPT mercantile artists have gone Americana! 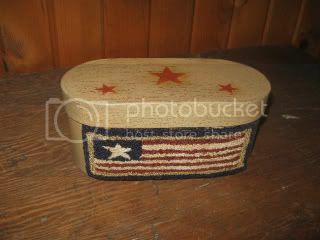 Please stop on over and check out some wonderful Americana handmades from our artists with updates on May 1st and May 15th. I am sure you will be delighted. Yours truly will be there too! 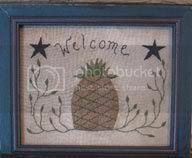 Welcome to the GRAND OPENING of my selling blog! 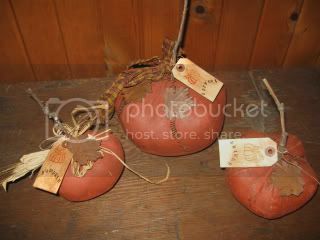 Here is a wonderful primitive staple for your home! 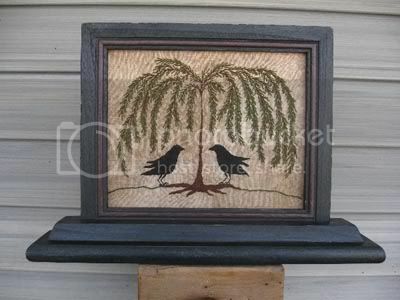 A simple design of a full weeping willow tree and two olde black crows perched on the roots of the tree. 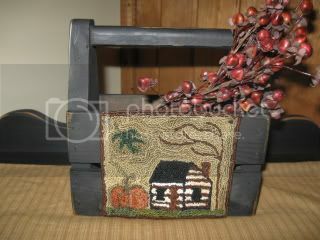 I did my stitching on a wonderful piece of coffee dyed old linen. 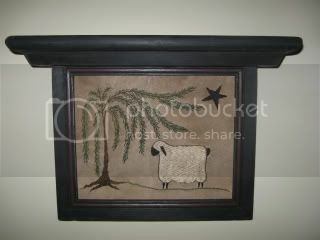 This great frame can stand or be hung up by the sawtooth hanger. 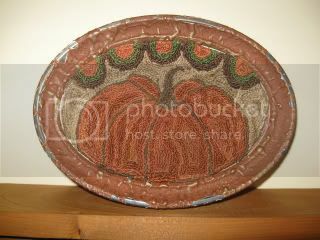 Simply remove the stitchery from the back of the frame and switch it around. 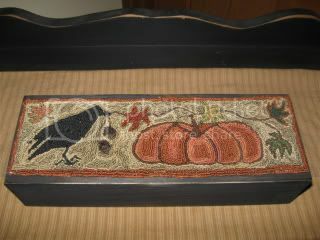 The black distressed frame has glass and the measurements are 14" wide x 9 1/2" long and the base/shelf is 2 1/2" deep. It will come signed, dated and copyright 2009. 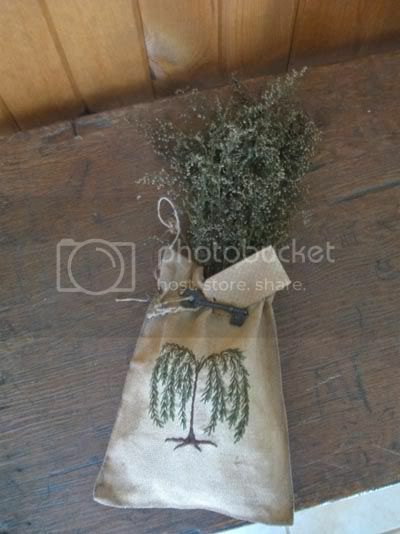 I had a lot of fun making this primitive willow tree sack! 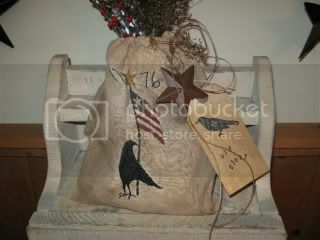 I used an old linen towel to make the sack, there are even a few small tear holes on the towel to add to the charm. 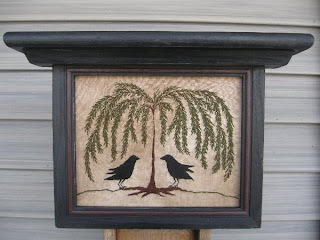 I hand stitched a small weeping willow on the front and then heavily aged it with coffee. 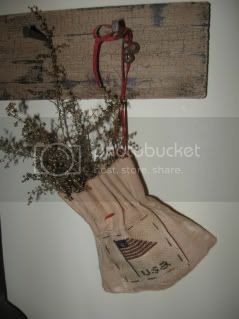 There is a aged draw string, 2 rusty bells, a skeleton key and hang tag attached by rusty safety pins. 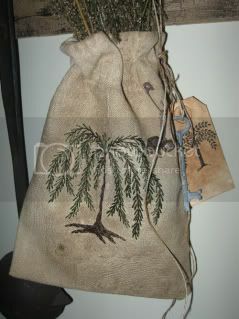 I stuffed the sack with a bunch of Sweet Annie. 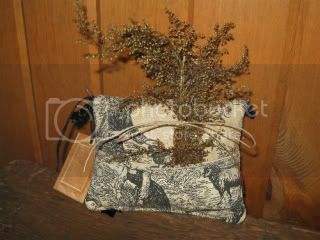 The sack measures about 8 1/2" long x 7" wide. It is signed on the back by me. 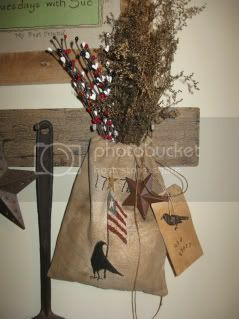 This little bag looks so cute hanging from a hook, peg nail or knob. 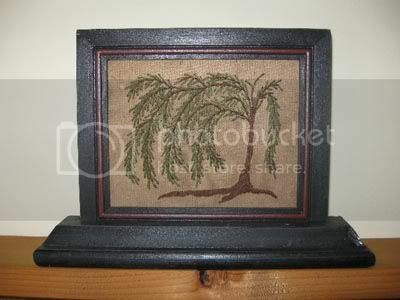 I designed and hand stitched this small willow tree off to the side. 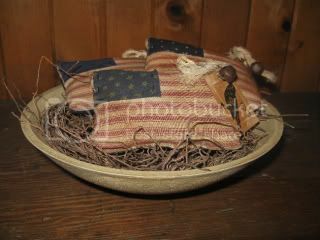 It was worked on an old piece of coffee dyed linen. 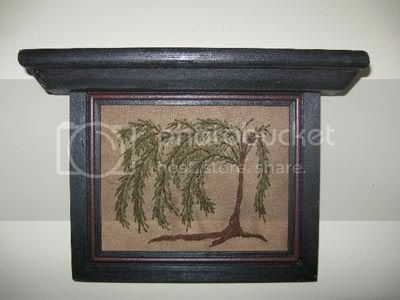 This black distressed frame can be used standing or can be hung up by the sawtooth hanger. 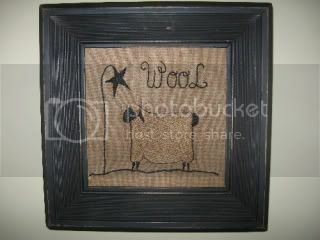 All you need to do is take the stitchery out from the back of the frame and flip it. The measurements are 7 1/2"wide at the base/shelf and 5 1/4" tall, and there is glass. It will come signed, dated and copyright 2009. 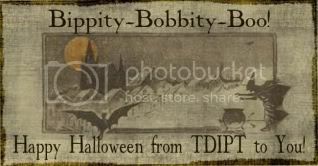 Be the first to purchase from my selling blog and you get this freebie! 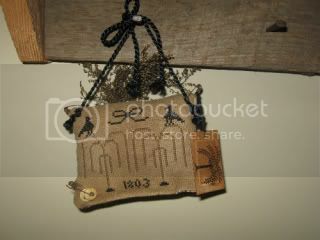 I designed and hand made this little hanging stitchery book. 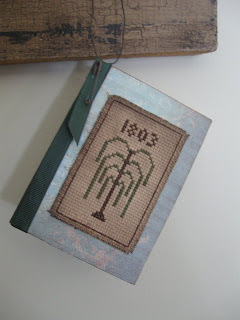 I have cross stitched a tiny willow tree along with the year '1803' on coffee dyed counted thread. I frayed the edges of the stitchery and glued it on top of a little composition notebook and covered it with old looking blue and cream paper. I stained up a piece of green ribbon and ran it up the side of the book and fastened it with a rusty safety pin. I then ran a rusty wire through the ribbon to use as a hanger. A little rusty bell is attached to the wire. The little book measures a very small 3 1/4" wide x 4 1/2" long, my initials are on the back. 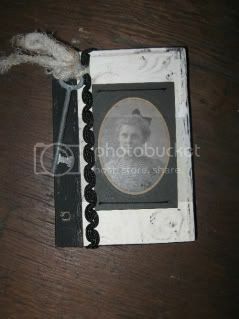 A sweet little book for hanging on a peg nail or knob.